Simple Country Living. : Green Shoots and a Bag of Twigs! Green Shoots and a Bag of Twigs! What a difference! The weather is sunny but breezy and apart from a short, sharp hail shower this morning while I was feeding the llamas, it's been surprisingly fine. I realise I'm just being a hopeless optimist but it's nice to see the sun again ...... even if it does highlight just how dirty my windows are! Not only is the weather nice but things are beginning to sprout. I went for a walk down the lane this morning after finishing the sad task of burying Amelia Pond, one of my original pair of chickens. My other one died a few weeks ago and sadly, I had to have Amelia put to sleep yesterday. Anyhow, I thought a walk in the sun would be just the thing to cheer me up so I grabbed my camera and headed off down the track. It doesn't look like much is happening from a distance but when you get closer, things are definitely starting to sprout. I have no idea what these little tufts of greenery are but it's nice to see some lovely green shoots popping up. My daffodils have been out for about 10 days now I can't believe they're so early. I even had some miniature daffs sprout in an abandoned hanging basket that I had taken to the compost heap and forgotten to tip out!! As I was walking back home, in the bush next to the road was this cheeky chappie. He was singing at the top of his lungs, I've never noticed before how piercing robin song actually is, he was making a right old racket but he obligingly stood still for a good 5 minutes while I snapped away. As to the bag of twigs, About 4 weeks ago, a junk email pinged into my inbox from a well known plant company and I was about to delete it when I noticed they had an amazing offer on. 12 bare root shrubs for £12 plus P&P. I thought it was a bargain so I decided to order some. They arrived yesterday looking a little less awe-inspiring than I had anticipated but nevertheless I can't wait to get them planted up. They're in pots at the moment until I can sort out the ideal spots for them. The bag of twigs do look a little underwhelming, don't they? What will they be when they grow up? Sorry to hear about poor Amelia. :( So do you just have the one you fetched after Pepper Potts died? I hope you can get a few more so that they can all scratch around together - and you have lots of eggs. 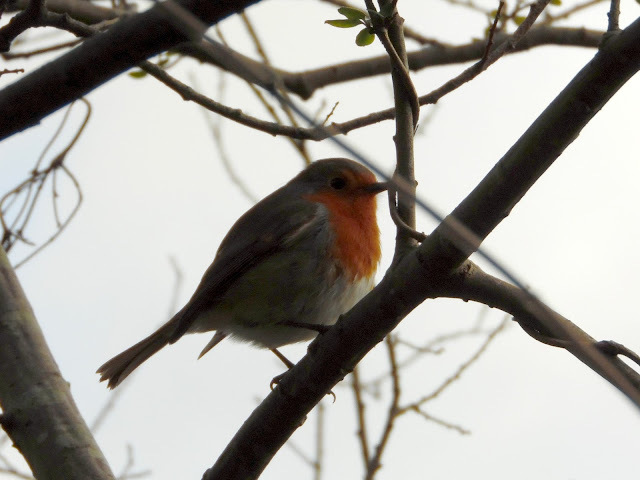 Robin song is very piercing outside your window at 5am! Your lane reminds me of Clay Lane, and you have grape hyacinth as well now! I keep meaning to ask - that little white pony-lawnmower, did it eventually become yours? Unfortunately no she didn't. Because the overtime at work that was making my pay packet nice and healthy before Christmas has gone now and I'm only doing my contracted hours, I decided I couldn't commit to the expense of having her. Horses are expensive to look after what with vet bills and farrier bills etc and I am a firm believer that when you take on the responsibility for an animal you do so for their life span. I decided that it would be nicer for her to go to a family with children who would be able to learn to ride on her and spend lots of time playing with her. I still get to go and play with my friends horses and ponies so I totally get the best of both worlds. I once bought whips for a hornbeam hedge (about twenty yards long) but when I picked them up from the nursery it looked even less impressive than your twelve shrubs and it cost me £90. Within months it looked considerably better value! That robin is just lovely. Your English Robins are so much cuter than our American ones. They look to be smaller and so chubby with that bright red breast stuck out there for all to see. Maybe he isn't so chunky but just has his feathers fluffed out to retain body heat?